The Elevated Chin Up Station takes chin ups to a new level-literally. 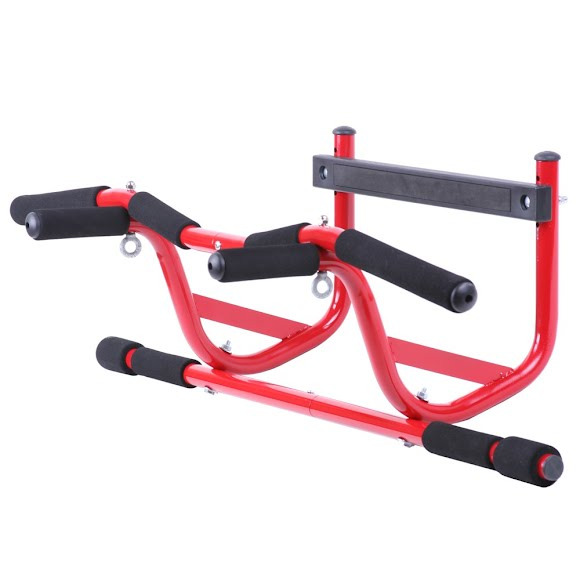 GoFit multi-use Chin Up Station incorporates a new patent-pending design which elevates you above the door frame giving more clearance and a full range of motion for a better workout. The Elevated Chin Up Station instantly and easily mounts in a standard doorway with no screws, using leverage and gravity. The Elevated Chin Up Station takes chin ups to a new level-literally. GoFit multi-use Chin Up Station incorporates a new patent-pending design which elevates you above the door frame giving more clearance and a full range of motion for a better workout. The Elevated Chin Up Station instantly and easily mounts in a standard doorway with no screws, using leverage and gravity. Chin Up Station MountingThe Station can be used for chin ups and pull ups in several hand positions at two elevations, as well as sit ups, push ups and dips. Abdominal straps are sold separately, to be attached onto provided.